Download Clean Laptop Mockup PSD. If you are looking for windows laptop mockup for showcasing your web and UI designs to your client or in your design portfolio than this Free Laptop Mockup PSD is perfect for you. Here you have a 13-inch Windows-based Laptop on a white wooden table in a clean indoor environment which is great for showcasing your design in a professional manner. This Clean Laptop Mockup is designed in Adobe Photoshop and it comes with smart objects which you can use to display your designs in a few simple clicks. So download this Clean Laptop Mockup and add your own image on the laptop screen and showcase your web or GUI design in a unique way. Hope you like it. Enjoy! Download Samsung Laptop Notebook In The Park Free PSD. 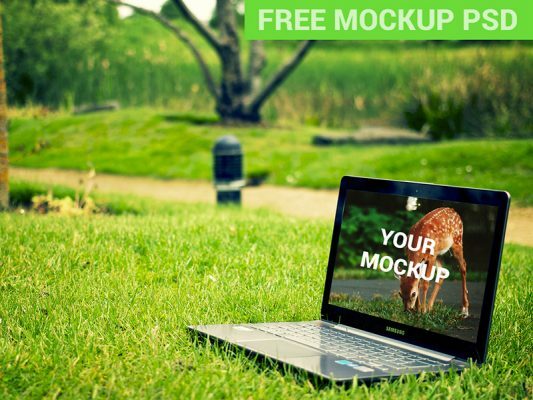 Use this neat high resolution notebook mockup to showcase your apps and web design projects in a natural environment. The psd has smart layers so you can easily place your designs on to the screen.